Isn’t this different? I really enjoyed making this purse. It has such a classic look. This can be made this way or drop the shoulder straps and start the body right from a wooden grasp handle to have a hand bag. After constructing the handles, I crossed over one left strand to the right strap and one right over to the left to bridge the two straps. Four cactus green, then eight white and then the last four green are larks head knotted over the bridge. This is repeated on the other side. A square knot on the strap is added to line up with the first green SK on each side. Two black cords, folded in half are added, one row at a time to all four corners. At this point the base is made. Fourteen rows of alternating square knots are made decreasing by one with each row until you are left with one knot to make in the last row, forming a V shape. Once this is completed on both sides of the purse, you lay them side by side with right sides facing up. Pin them to a board with the end knots at the top just touching. The first cord from the right purse side is crossed over the left purse side along the bottom edge of the finished square knots. Double half hitches are made over this cord using all the cords from the left purse side down to the last white to the inside of the black cord. Then the top cord on the left crosses over the right purse side and double half hitches are made over on the right side. 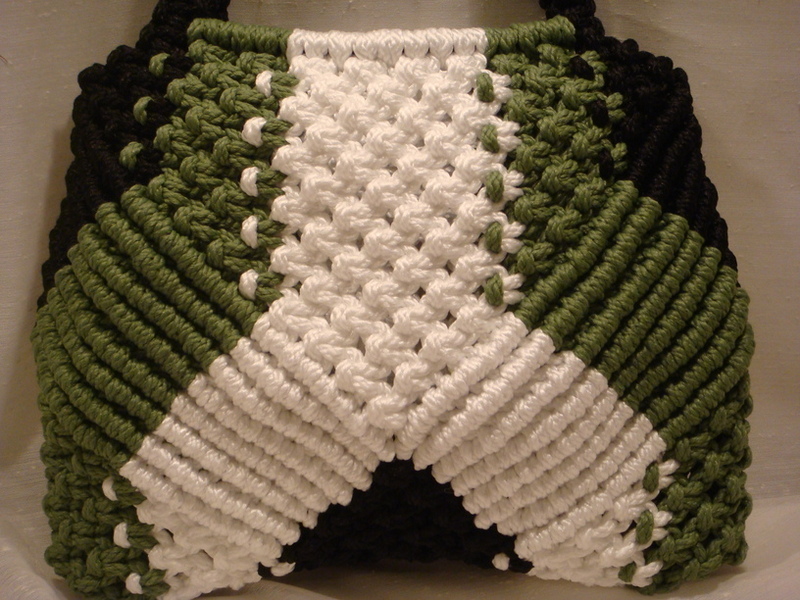 This continues in an alternating pattern to form the side of the purse and attach the left and right sides together. It will be complete after the last black cord is hitched over and moved to the bottom. Now one green SK is placed at the base of the black in the middle using two green cords from the right and two green from the left side. Continue alternating the SK until eight rows are completed down into the white area. It is a little hard to image that it is the side of the purse until you unpin and refold the purse lining up the handles. The other side will need to have this done also. Here you can see with the realignment that only one side is done. Open up the purse once again and fold it so that the loose cords meet and touch as they did with the first side. The finished side is to the back. You will need to pin through both layers to secure it. Again start with the top cord from one side and cross it over the other side and double half hitch down the eight rows per side until all eight black cords from each side have moved to the bottom of the purse. Finish with the eight alternating SK down through the white cords at the bottom. You will see that there are the black cords left in the front and back. Just like the side bottoms, make alternating SK, but there will be only four rows. This should bring all the cords finished evenly. To bring all sections together, make two final rows of alternating SK all the way around. Turn the purse inside out and tie off to close, cut and melt ends. Turn right side out and line the inside. The finished size is 12″ x 9.5″ with a strap height of 11″. The colors used are black, cactus green and white. The ribs formed by the half hitches give a round, full look to the entire purse. Let me know what you think of this design. I think it could go with most outfits. 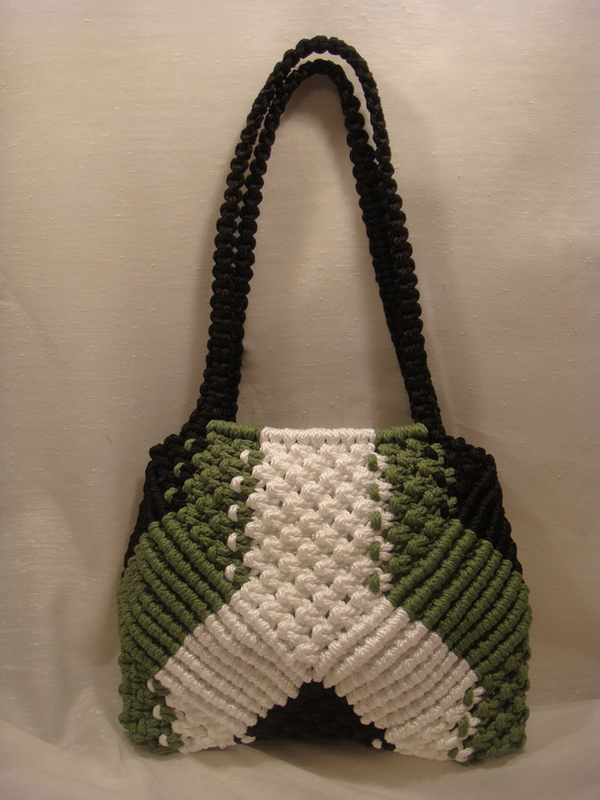 This entry was posted in Finished Projects, How-To, Main Page and tagged black, cactus green, half hitches, larks, macrame, macrame purse, medium, purse, shoulder strap, style, white. Bookmark the permalink. Oh, love this pattern! Love the color choices too! Going to have to see this one up close! If I were to make another one, what other color combo do you think would be a good universal blend? I liked this purse very much..
Can we connect through mail?